Playsoft have extended into the field of iPad apps with a creative play-with-the-kids app called Touch of Fun. Touch of Fun contains 8 different games and makes full use of the iPad’s multitouch facilities – the games are for 2 to 4 players and it’s all done intuitively with the hands. •BUBBLE GEYSER: Drag as many bubbles of your assigned color to your side, or pop your opponents’ bubbles! •AIR SOCCER: Protect your goal and score with the tip of your fingertips. •SHOOT FOR THE STARS: Control your laser cannon and shoot the stars to score points. •SPLASH PAINTER: Be the craziest painter and cover as much of the canvas as you can. •COOKING MADNESS: Drag your necessary ingredients to your pot to quickly complete recipes. •GHOST CATCHER: Be ready to catch the wandering ghost when he appears to score points. 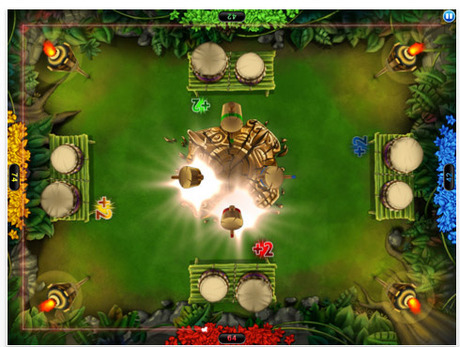 •TOTEM OF FURY: Hit the totem as much as possible without breaking it in this nerve-breaking game. Quite entertaining, I’d love to see more minigames in the application, but those that are available are sufficient for many hours of fun. Those games are amazing, I had so much fun with friends, I hope they will make more games like that. I had great time while playing this game! It’s good entertainment for kids and grown-ups as well.